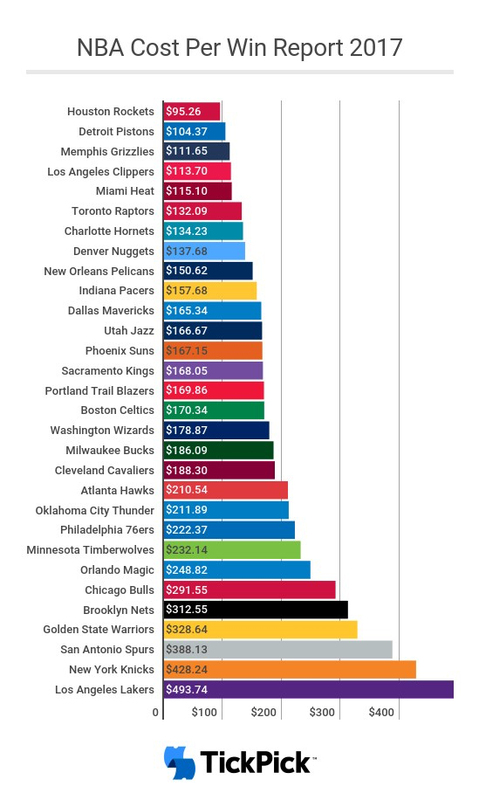 With the NBA season tipping off this week, secondary ticket marketplace TickPick has released its annual Cost Per Win index showing how each of the league's 30 teams rates in terms of giving fans bang for their buck. And the Indiana Pacers are in the top tier. To figure the cost-per-win value, TickPick takes into account in the team’s average ticket price on the secondary marketplace and the projected home win total for this season. The Pacers, having parted with star forward Paul George and added several new faces included IU grad Victor Oladipo, are a bit of an unknown quantity. Las Vegas oddsmakers have put the club's over/under win total at 31.5 this season. Herzoff said that is the number TickPick uses for its index. Pacers General Manager Kevin Pritchard has said he believes the team will be better than oddsmakers project. If that happens, the team’s cost-per-win index value could be even lower. The Pacers kick off their season Wednesday night at home against the Brooklyn Nets. The tip is scheduled for 7 p.m. Despite adding Lonzo Ball, the No. 2 overall pick in the most recent draft, the L.A. Lakers have the highest cost-per-win rating at $493.74. The Houston Rockets, who beat the defending NBA champion Golden State Warriors on Tuesday night, have the lowest—i.e., the best—ranking with a cost-per-win rating of $95.26. With the addition of point guard Chris Paul, the Rockets are expected to be one of the best teams in the NBA’s Western Conference this season.